Beaker Concepts burst onto the hydration scene a few years ago with the carbon HydroTail, and is quickly becoming a staple in the high tech biking arsenal of triathletes all over the world. From amateurs to most notable world champions like Norman Stadler, this lightweight behind-the-seat hydration carrying system is as common on today’s long distance racing scene as aero helmets. The new aluminum H5 soon followed as a more cost effective solution to the old problem of transporting liquids for long rides. I have been testing the H5, as well as several others hydration systems over the past few years, and this is not a bunch of smoke being blown by Beaker Concepts. The H5 was easier to install than the others I have ridden with, partly because of the thinner metal, and lack of star washers. The H5 came in considerably lighter than the others, and did not sit above the saddle like the XLAB Flatwing, which made mounting the bike a breeze. The H5 was taken on some of the roughest paved roads in and around Boulder County, as well as across the some of the nastiest railroad tracks in the area without a single water bottle ejection. Of particular note, the same water bottle cages were used on the H5 that were installed on the other systems. It is my theory that the reason for zero ejections was because the H5 does seem to have a slight amount of flex when riding over bumps, potholes or railroad tracks, which negates the inertia which would otherwise eject bottles. While I did not get a chance to test the actual carbon fiber version of the HydroTail, the H5 performed its function as it should. I had tried different configurations including a single bottle cage off of the back/third set of mounting holes, with the same results. Looking at some pictures of the H5C on other forums, I had attempted to invert the system by mounting it upside down (which puts it in comparable bottle to saddle height with the XLAB Flatwing.) Unfortunately, without bending the H5 frame I was not able to accomplish this and fasten the H5 brackets on my Fizik Arione 2 saddle. Whether or not it would work with another saddle that has a different rail angle, is something I will have to attempt with future saddles. While the H5 sits quite low compared to others on the market, it is with good reason, as it seemed to be completely hidden from the turbulent airflow which normally comes off the rider’s lower back. The only “con” I seemed to experience with the H5 was the bottles were slightly out of reach in the aero position (which may be from me having short arms). But the 1-2 inches out of reach issue was exactly what I had experienced with the other behind-the-seat hydration systems as well, so it scored even with the others for aero position reach. However, when sitting up pedaling, the bottles were right within my grasp, and no twisting of the body was needed. I was able to utilize the XNUT in the third cage mounting holes to thread on an inflate adaptor and CO2 cartridges as well, I really think it would be best to just tape the cartridges onto the seat post or just below the seat post clamp or use the Velcro straps which are included. Below are the specs for the RECENT three different systems I have tested, using an Ultimate Table Top scale, brand new and out of the box. 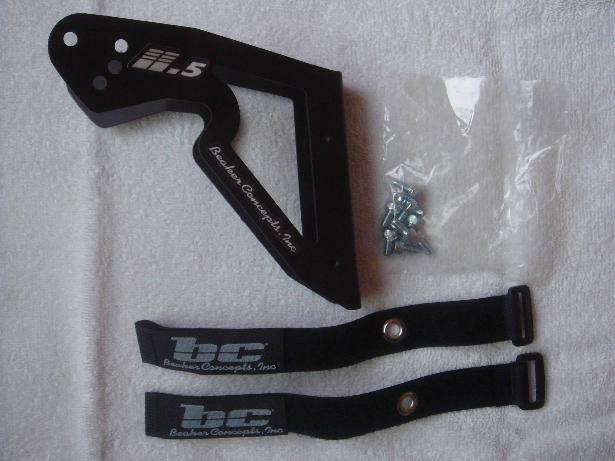 When I spoke with Andrew Block of Beaker Concepts about the H5, it was only a day and a half before my new H5 arrived. That sort of service, in my opinion, sets Beaker Concepts a step ahead any other response times I have encountered to date—a real plus! In summary, the H5 performance, communication, and response time with Andrew Block was impressive enough for me to enter into sponsorship with Beaker Concepts as the official hydration system of Gemini Multisport. The H5 comes in multiple colors, is made of durable aluminum, moderately priced, and offers a variety of mounting holes for varying position setup. Included are several wide Velcro straps to hold spare tires or tubes, as well as a CO2 cartridge with an adaptor nozzle for it, and retails for about $50. This is the system I had been using the last year or two. Durable, but borders on the heavy side, and is slightly harder to mount than others I have tried. This system is almost “overbuilt” in my opinion, but it did its job. I like that XLAB is coming out with new versions such as the “mini” and the carbon versions, it shows they aren’t resting on their laurels with companies like Beaker Concepts coming online. I have managed to eject several water bottles which I think could be due to the stiffness of the unit, but bending the bottle cages tighter around the bottles to hold them in only made it more difficult to get the bottles out when needing to drink. The bottles are slightly out of reach in the aero position, about 1-2 inches too out of reach. I liked the XNUT which is simple to mount, but adds quite a bit of weight. I would think XLAB could thread the unit’s frame for a couple CO2 cartridges, and a male threaded portion for the inflate adaptor. Strapping on a spare tubular tire seemed to interfere with taking a bottle in or out of the cages, and two spare tires seemed nearly impossible. Jeff, one of my creative duathlon friends who tinkers in metals and woodworking, created several prototypes of rear hydration systems. He created a system that is not only lightweight, but offers more bottle cage angle positions than any other system on the market (even today—although it is nearly 10 years old), is competitive in weight with modern systems, made of durable machined aluminum, plus the bottles are close enough to the saddle to reach bottles in the aero position. In fact, I managed to use it one year at the Hawaii Ironman, with great success. There was plenty of space to fix a spare tire or tube with straps, and it just looks fast. The downside was, the mounting system consisted of too many spacer plates and individual parts, and took me nearly 1.5 hours to fix onto my saddle rails, as the mounting hardware was far too complicated and inaccessible. The other part of this was, the number of cage bolt mounting holes while many, were not drilled in a configuration that was foolproof as far as bottle ejection was concerned. Great idea, it just needed some tweaking and someone or group with the financial backing to put it into production and marketing mode. Until Beaker Concepts came along, this prototype was lighter than just about anything out there. In a nutshell, the rack bounced a lot, and the rail clamp plate was quite thin and had bent whenever any degree of torque was used to keep the assembly from loosening. I used this assembly in Kona one year, and it almost completely fell apart 80 miles into the race. The bolts had jiggled loose, and ended up hanging by half a thread twist of the screw on one side of the mounting plate. Another problem with this rack was the many ejected bottles during training rides. Despite these issues, racking your bike on race day was a breeze as the upside down “L” shape could be used to hook onto the bike rack with the front tire facing away from the rack. This would likely be my last choice of saddle mounted cages I have tried, merely for the poor quality mounting clamp, loss of bottles, and flex in the carrier itself. Untested. This particular rack looks almost identical to the Tri All 3 aqua rack I tried many years ago. I am not sure if they sold the patent to Profile or whatever happened to it. It was easy to mount, inexpensive, not the most durable, and at 230 g it seems pretty heavy. The Tri All 3 rack (no longer sold) fit on any round seat post, but wouldn’t be much use for today’s aero seat posts. If there were any sort of one screw simple system for a round posts, this was it. Although I did have problems attaching a spare tubular for races, with CO2. There is a lot to say about these shoes while at the same time not a lot to say. It is hard to argue that Peter Reid used these shoes on the way to winning the Ironman World Championships because they were not adequate. Upon looking at age groupers and top pros at the 2008 Ironman World Championships in <?xml:namespace prefix = st1 ns = "urn:schemas-microsoft-com:office:smarttags" />Kona, Hawaii, you see many pairs of the Specialized Tri shoes in use. The 2009 model has not changed aside from cosmetics, nor has the quality of the shoe. I have had the opportunity to test out these shoes, which were in part designed with the help of famed biomechanical expert Dr. Andy Pruitt of the Boulder Center for Sports Medicine. This shoe was designed with a slight arch or cant in the sole as most or nearly all cycling shoes are built with a flat sole. We all know that our feet are not board flat. Even flat arches have a tad of lift in them. With a narrow “B” foot, I fit into a 44.5 (European size), but the middle of the shoe just felt a bit unsupported even with the arch—a little sloppy you might say. Upon adding a medium arch support insole (Blue Specialized Body Geometry), the space/sloppy feeling disappeared, and became a perfect fit. The insole provided in the shoes seemed to be of average to slightly below average quality in my experience. The heel did not seem to be anchored in the shoe as I have fairly narrow heels, but the shoes were not broken in so that may change as time goes on. A little water and sweat helps shape a shoe with enough use. On weight, these shoes seem to be competitive with other major brands on the market, and are plenty stiff with their white carbon fiber soles. 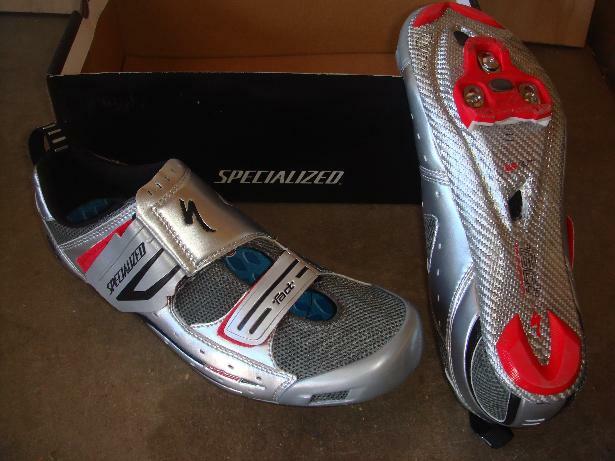 Specialized uses their own stiffness index, of which these are rated at 8.5. After confirming with the internet and a Specialized employee that this is really an arbitrary scale they alone use, the 8.5 rating really has no meaning outside of Specialized products for comparison. I was skeptical at first, as there is not such a thing as “white carbon fiber” so the name is somewhat misleading. Sometimes a layer of aluminum is used in the sole to give it a cosmetic appeal. From what I read, the sole is meant to reflect the heat from the road. The so-called 100% carbon fiber soles bike shoe companies often refer to is the carbon fiber in the soles is in fact 100% carbon fiber. HOWEVER, the resin and fiberglass and whatever else a company may use to fill in the spaces between the carbon fiber makes few shoes true 100% carbon fiber soles. There is a play on words here, so don’t be deceived. One company that uses true 100% carbon fiber minus fiberglass is Rocket 7 (see review below). On breathing, these shoes are definitely cool. The shoes dissipate heat immediately, so if you live in hot climates during the summer such as Colorado, Arizona, Florida, or Texas, these are the shoes to have. Again, you give nothing in stiffness, they breathe excellent, and the Velcro strap is wide, and fully adequate to snug up on the fly. Entry in and out of the shoes is on par with most major brands, and the price range of $160 will draw many athletes in the hard hit economic times of today to purchase these. The Look drilled cleat mount threads were well chased, and mounting was not an issue. Tiny vents on the bottom of the shoe added to the ventilation of the shiny, silver-black & red tri shoe. Upon pedaling hundreds of miles of Colorado roads in these shoes, I find them quite comfortable with the loose heel not affecting watt output according to my power meter. If anything, because they are so comfortable, I would have to say there seems to be a slightly higher wattage output be just a few watts. Another thing, they look really fast! Shimano now has a custom shoe line. While I had used a pair of TR01s, the shoes were plenty stiff, easy to slip into, well vented, priced nice and looked slick. They were somewhat heavy, and the single reverse strap didn’t seem to be long enough as with my narrow feet it was difficult to tighten down enough. The mesh upper wore out rather easily, but didn’t seem to really affect the cycling. One improvement Shimano can make to this day is to find a way to lower the weight of their production models, and pull into the realm of adidas shoes and several other lighter shoes on the market. Here we have a very, very expensive cycling shoe. Either semi-custom or full custom, these will cost you $500 roughly, or more for full custom. The stack height is much lower than the Shimano shoes, so seat height will need to be altered a bit. In short, your foot will be closer to the pedal than a pair of Shimano shoes. One of the few 100% aerospace grade carbon fiber shoes, these are incredibly light, and stiff. The leather can be stretched if you order them incorrectly, but you must find a good shop to do that correctly. The problems I have with these shoes are developing hot spots on the bottom of the foot. There is very little cushioning in these shoes and little to no padding. They do seem comfortable if you nail the sizing just right. The exceptional parts of these shoes are the lightness, and quickness you feel when pedaling. They do not vent very well, and finger pull up loop on the heel could be better placed up/down rather than from the inside of the heel to the outside. The cosmetic rubber border around the perimeter of the bottom of the sole has begun to disintegrate not even a year into using them from the heat. Colorado is a low humidity state, and that may contribute to the cracking and sliding of this perimeter in addition to extreme heat of the summer. For the cost of these shoes, I found the quality of mass produced shoes of today, to be adequate or comparable to these shoes for different reasons. The custom color options and embroidery, as well as the reverse closure strap make this shoe something desired for the fashion plates out there.